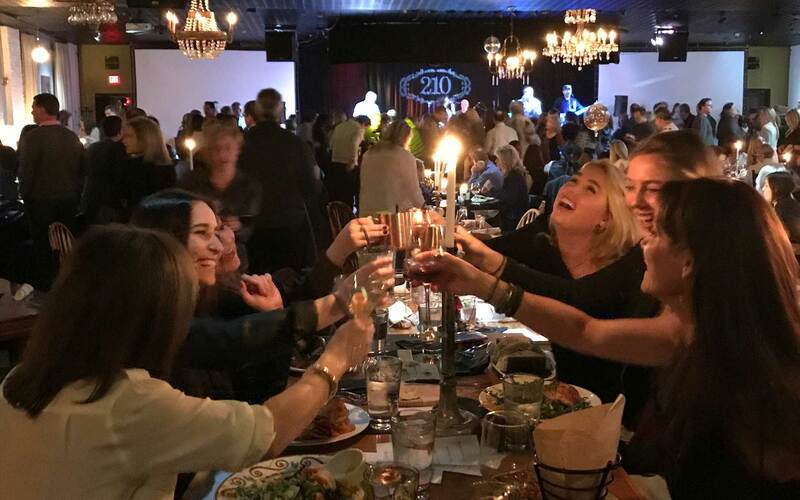 210 Live (210 Green Bay Road, Highwood, IL), the restaurant and live entertainment venue, has announced the addition of new Chef Peter McCarthy, along with a new menu. McCarthy has re-thought 210 Live’s food program. Everything is freshly made from scratch. 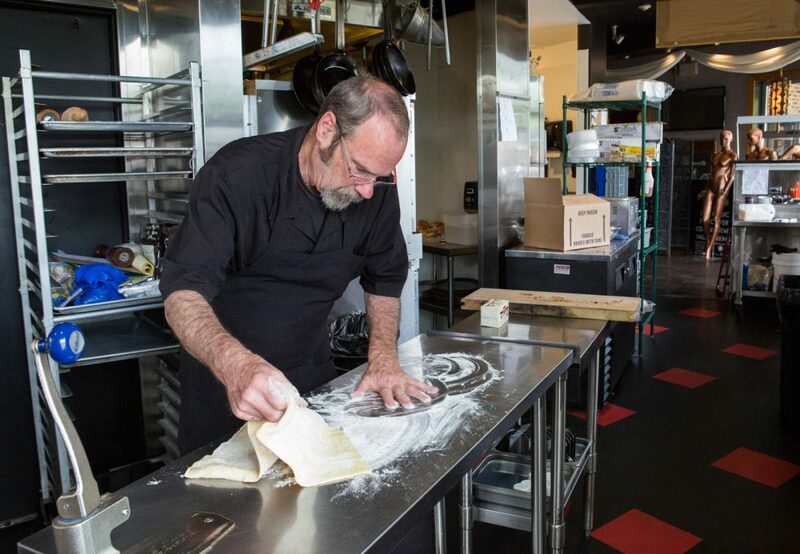 He has also streamlined the menu and the kitchen operation so that food is prepared and served to customers quickly. Since the club also attracts groups for private events, in re-doing the menu he wanted to make sure that the menu items were scalable. “Barbecue and good music have always gone together. 210 Live boasts an outstanding, high-volume wood smoker, so barbecue, smoked to perfection every day, is at the front and center of our food program,” said McCarthy. 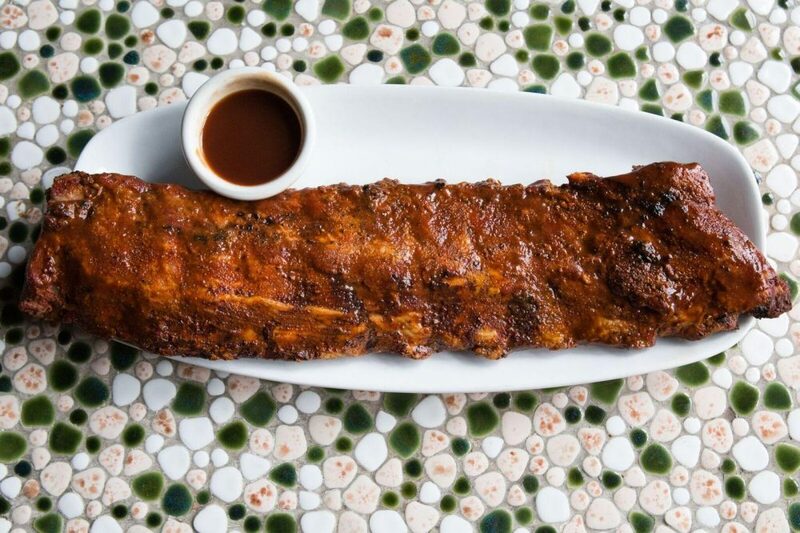 “I am passionate about barbecue and have worked in some great barbecue restaurants, including Sweet Baby Ray’s in Wood Dale, and so I have elevated the quality of all our smoked meats.” 210’s guests can enjoy House Smoked Wings as a starter, plus a delicious BBQ Brisket Sandwich, a half or full slab of slow smoked Baby Back Ribs, a slow-smoked Half Chicken, or a Smoked BBQ Brisket Dinner. 210 Live also offers online ordering and curbside pickup for its barbecue and side dishes, so folks can enjoy them at home. 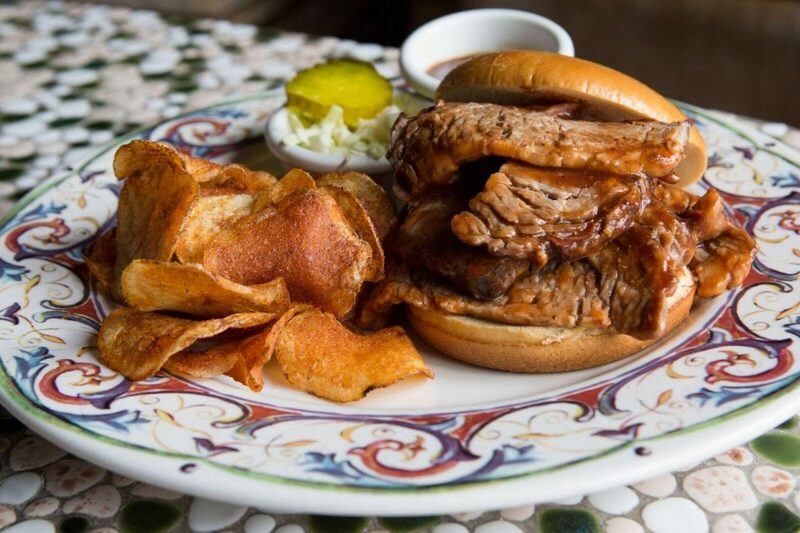 But barbecue is only one of the many choices available on 210 Live’s new dinner menu. Chef McCarthy’s collection of sharable starters includes a Crab Cake, Maryland-style, 100% blue crab, pan seared on a bed of coleslaw with Cajun remoulade ($16); Vegan Guacamole, Hass avocados, diced onions, tomatoes, jalapeno peppers, cilantro, fresh lime, with tri-color corn tortilla chips ($10.50); Bacon Wrapped Dates, Marcona almond-stuffed dates wrapped with cherry wood smoked bacon, and red pepper puree ($12); Tuna Poke, ahi tuna cucumber, avocado, wasabi, sea salt, guava, tamari soy, sesame oil, toasted macadamia nuts ($13.50); and Shrimp Cocktail, jumbo wild gulf shrimp on a bed of arugula with house-made cocktail sauce and lemons ($16.50). Lovers of French Fries will enjoy the hand cut Idaho potatoes, served with garlic aioli—choice of sea salt or truffle parmesan. A daily homemade soup also is available in cup and bowl sizes ($4/$6). Salad options on the new menu include a Classic Caesar Salad, with romaine hearts, Pecorino Romano cheese, croutons and homemade Caesar dressing ($10); Chopped Salad, with romaine, buttermilk blue cheese crumbles, avocado, bacon, tomato, cucumber, served with buttermilk ranch or lemon vinaigrette ($10; add grilled chicken $5, mahi-mahi $8, grilled shrimp $8); and a Vegan Israeli Platter with hummus, baba ghanouj an Israeli salad of cucumber, tomatoes and parsley, and pita bread ($11). The House Salad is an accompaniment to any meal, made with romaine lettuce, cucumbers, tomato, buttermilk blue cheese crumbles, with choice of chipotle ranch dressing or white balsamic vinaigrette ($7). In addition to the BBQ Brisket Sandwich (smoked beef brisket on a potato bun, housemade coleslaw and BBQ chips ($16), guests can choose a Crab Cake Sandwich on a brioche bun with Cajun remoulade and BBQ Chips ($17.50); Beef Sliders, two sliders prepared with grass-fed ground beef, pimento cheese, bread and butter pickles, Hawaiian slider buns and housemade BBQ chips ($16); Grilled Chicken Sandwich, with lettuce, tomato, chipotle mayo on brioche bread with housemade BBQ chips and coleslaw, and bread and butter pickles ($11). Everyone will love the Impossible Burger, a vegan burger served with lettuce, tomato, pickles on a toasted potato bun and hand cut French fries ($15). 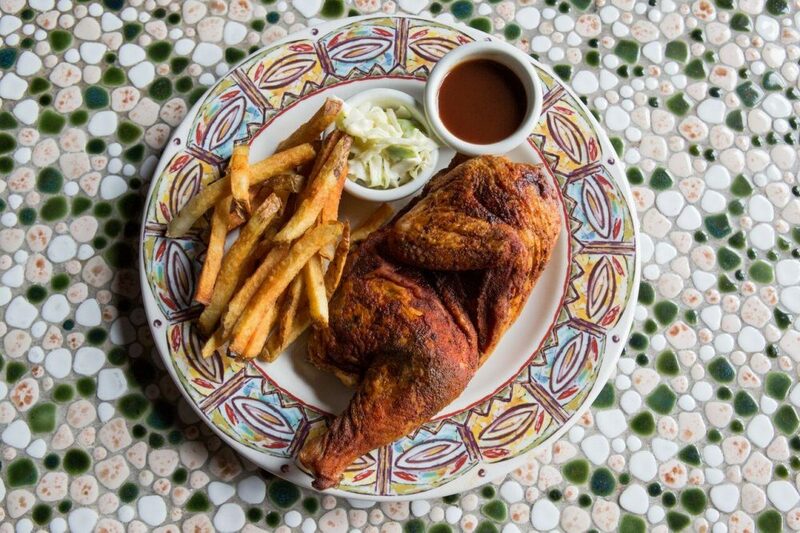 Barbecue fans can choose the slow-smoked Half Chicken, served with fries and coleslaw ($16.50) or the Smoked BBQ Brisket Dinner with mashed potatoes and roasted asparagus ($19.50). Other main dishes include Jambalaya, a classic Cajun rice dish with andouille sausage and Louisiana-style BBQ wild-caught red shrimp ($17); Fish Tacos, sautéed mahi-mahi, cabbage salad, chipotle cream sauce, flour tortillas ($15); or Mahi-Mahi served with mashed potatoes, roasted asparagus in a lemon caper sauce ($20). Once you’re on the dance floor, don’t forget to take a breather and sit down to enjoy one of Chef McCarthy’s luscious desserts ($8-9), which include an Apple Tart, a Three-Layer Chocolate Cake, a Coconut Bread Pudding with Myers rum, a Chocolate Chip Cookie Sundae, and dessert specials such as the Death by Chocolate flourless chocolate cake currently on the menu. 210 Live's Happy Hour begins at 4 p.m. until 7 p.m. Wednesday through Friday, starting November 1. Happy Hour features half-price cocktails and no cover charge. Chef McCarthy also is developing some new small plates for Happy Hour, to be introduced soon.